Well, the James Beard Foundation released its list of 403 semi-finalists in its chef and restaurant categories (not including the design and graphics awards, which don’t have semi-finalists). It’s a relatively fresh list, with only about half of last year’s semifinalists returning, which is about in line with the number of returning semifinalists last year, too. For the most part, the Beard Awards are a nice feather in your cap that if marketed properly can help boos sales in restaurants, and that’s about it. But the Rising Star award, given to chefs aged 30 or younger, can be a real career maker. Just ask Nate Appleman or Marcus Samuelsson or Chris Lee or David Chang or any of a number of other chefs who benefited from that nice piece of recognition. Nominations of semifinalists for the Beard Awards is open to the public, but now the final determination of the finalists and then the winners will be determined by a few hundred food writers and past winners and other people-in-the-know in the restaurant world. Except here. I’ll be keeping the poll to the right, listing all of the Beard Foundation’s “Rising Star” semifinalists, open until the day before the finalists are announced. So go ahead and vote. Last year the winner of the Food Writer’s Diary poll, Jonathan Sawyer, didn’t even make it into the finals of the actual Beard Awards. However Food & Wine magazine did name him one of the country’s 10 “Best New Chefs,” which is arguably better than being a Beard Foundation rising star. I doubt that had anything to do with this poll, but go ahead and vote anyway. Let your voice be heard. 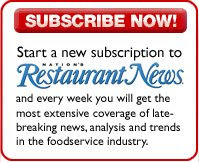 Bret Thorn is senior food editor of Nation’s Restaurant News with responsibility for spotting and reporting on culinary trends. He joined the magazine in 1999 after spending about five years as a journalist in Thailand. A graduate of Tufts University in Medford, Mass., Thorn also studied French cooking at Le Cordon Bleu Ecole de Cuisine in Paris. He studied in China for a year, too, and now lives in Brooklyn. How do you cook a 13-pound lobster?